Mayor Steven Huang informs the Rotary about the state of the city. 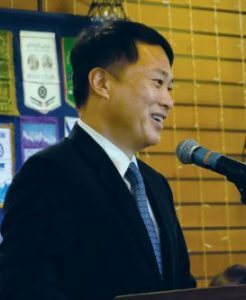 Dr. Steven Huang tipped his hat to his predecessor and outlined the way he planned to follow up as mayor in his State of the City presentations last week, both at a city-run town hall meeting and at the weekly Rotary Club of San Marino luncheon. last year by Steve Talt (who remains on the City Council) regarding “no more kicking the can [down the road]” in fiscal matters, and to help guide the city to being more efficient, with services more effectively rendered to residents. In his presentations, Huang said his goals from an administrative point of view included fully implementing Envisio, strategic plan and performance management software used by local governments; continuing to overhaul the city’s budgeting process; and expanding ways of retaining local businesses. “We have tightened the rules a little bit more, so if you want to do anything, please ask us first,” he said during the Rotary speech, referring to changes to historic preservation and tree preservation rules. Huang added that he hoped to continue building on last year’s reduction in crime by working with the Police Department to build awareness. On a related note, Huang said he felt one of the city’s biggest challenges this year will be selling the renewal of the public safety tax that generates more than $3 million annually for San Marino’s police and fire departments. Other challenges included looming pension obligations (“I think that goes for every city,” Huang said) and finding answers to the questions surrounding the city’s Recreation Department — which has had difficulty recovering costs of its programs — and its headquarters, the aging Stoneman building. “To update that building could cost $2 million or more, and the neighbors don’t want to see that building torn down, either,” he said.